Puerto Limon or Limon, head of the canton and the province of the same name and is located 152 kilometers east of San Jose, the Costa Rica capital, on the Caribbean coast; this beautiful Caribbean area is considered one of the most virgins and lush of Costa Rica, an area with the highest geographic diversification in the country, from mangroves to the high mountains. Limon remains one of the least inhabited or frequented areas of Costa Rica, allowing exploration of virgin forests and prehistoric unparalleled beauty compared to the rest of the country. Its port is the largest and most important in Central America for commercial use. This is a fishing village, most of the residents here are Afro-Caribbean descent, is for this reason that Limon always offers a rich experience culturally, this city is home to several museums and places of interest to travelers, as well as an impressive architecture that is unique in the area. In the center of the city is located the Parque Vargas, a beautiful park filled with tropical palm trees, sloths are often slowly climbing the trees. But also in this city you can find many places of great cultural and historical importance, among the buildings stand out for its antiquity and architectural beauty, the Post Office building which also houses the ethnohistoric Museum the Costa Rica pension, the Black Star Line, the Adventist Church, St. Mark's Anglican Church, the former commissary, the Peña building, Corella building, Ingianna building, the National Bank, the Park Hotel, the Tomás Guardia school, the Culture house and others in the historic center of the city. The city is separated from the sea by a boardwalk called seawall that runs along its coast in the urban area. 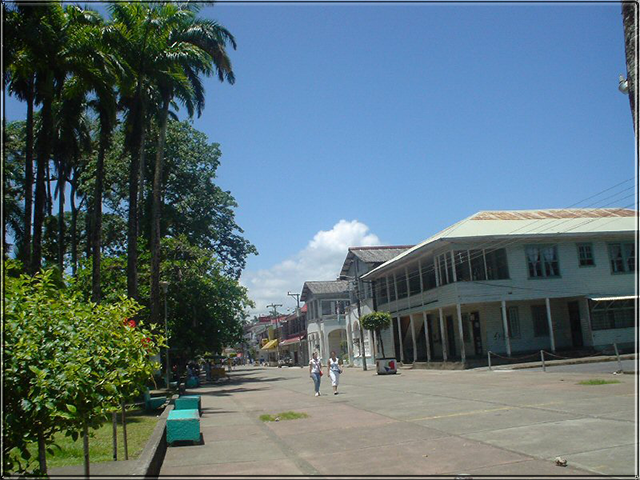 As a result of demographic explosion, the Limon port, has seen the number of its neighborhoods, and generally the province of Limón has the highest rate of population growth in Costa Rica. The official language is Spanish, but other languages such as English and Mekatelyu by people of African descent, and on the Atlantic littoral zone indigenous languages Bribri and Cabécar, in the cantons of Matina and Talamanca practiced. Limon owns the Moin port, listed as one of the most important ports nationwide for linking the country with European, African trade and the eastern United States; their economic activities have been based for a long time in banana production and livestock, and this zone is characterized by the largest black population of the country. The climate of this province is mainly humid and it rains in much of the year. This town have a charming culture, food, paradisiacal destinations and friendly people, are some of the main attractions that has this beautiful area you can't miss in your Costa Rica vacation.